China is way behind the rest of the world on solar installation, right? After all, according to Julia Wu of New Energy Finance, China currently only has 100 megawatts of solar PV installed, far short of the almost 4 gigawatts of solar already installed in Germany. But this narrow focus on solar PV ignores the huge progress being made in China’s solar hot water industry, which leads the world. This post will describe the growing solar hot water industry and also touch on the leadership of Yunnan province. Heating hot water uses significant amounts of energy globally. According to a LBNL report (PDF), water heating accounted for 26% of building end use energy in China in 2005. That’s more than lighting, which only accounted for 17%, and a lot more than cooling, which only accounted for 9%. 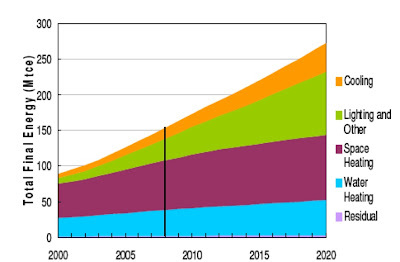 (The majority of end use energy was consumed by heating, accounting for 49% of end use energy consumption). Fortunately, cheap and proven technology already exists to significantly reduce these water heating needs: solar hot water heaters. Solar hot water heaters use the sun to passively heat water in a tank. Most solar hot water heaters in China consist of a water tank sitting on top of a series of glass tubes that take in sunlight. 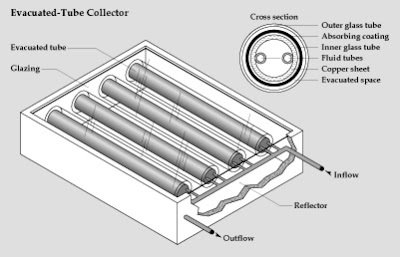 This type of system is referred to as an evacuated tube collector, since the tubes have a vacuum inside. The result is a renewable, carbon-free source of hot water. China is leading the world in installation of solar hot water heaters. According to the WorldWatch Institute, China accounts for roughly 60% of total installed solar hot water capacity worldwide, with nearly 1 in 10 households in Chinese households owning one. Buying solar hot waters in China is often a financial no-brainer. The average heater costs only about 1,600 yuan ($235), and can cover 100% of heating needs during the summer and usually at least half during the winter, drastically reducing energy bills. Solar hot water heater growth has been running at a 15-20% clip and doesn’t seem likely to abate soon, thanks to growing government interest in the technology. Shenzhen, for example, recently mandated that all buildings under 12 stories must have solar hot water technology. Solar hot water is also big business in China: the industry consists of over 1,000 manufacturers with revenues of over 20 billion yuan ($3 billion). The industry employs 600,000 people. Following on the success in the local market, Chinese manufacturers are now looking to take their products and know-how to the global market. The largest solar hot water manufacturer in the world is Shandong-based Himin Group. Himin produces over 1 million solar systems annually and claims a 14% market share in China. Himin recently received a $100 million investment from Goldman Sachs and CDH, which values the firm at more than $660 million dollars. Himin will use the money for further R&D and global expansion. Look out for more global expansion from Chinese solar hot water firms. 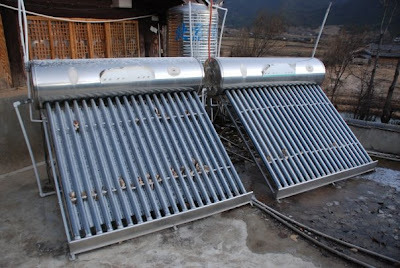 Yunnan province in southwestern China is leading this national move to solar hot water. I was lucky enough to visit this beautiful province earlier this month with two of my best friends, Ben Cooper of KEMA and Philippe Bouchard of eSource, and see the solar hot water heater industry’s progress first hand. I was shocked and impressed by the way solar hot water heaters dot the roofs of buildings in Yunnan. In Kunming for example, the capital of Yunnan province, more than half of the city’s nearly 5 million residents have solar hot water heaters. It’s not just the cities either: even small villages throughout the province have solar hot water heaters on almost every roof. The off-grid, distributed nature of solar hot water heaters also makes them ideal for developing countries, since they don't require much infrastructure investment. This is very big progress for historically poor Yunnan. Yunnan is the third poorest province in China with a GDP per capita of 9000 yuan per year, about 1/6 that of Shanghai. Hopefully as the world market for renewable energy and solar hot water heaters continue to grow, Yunnan can parlay it’s early successes with solar hot water into a model of sustainable economic development. Could you post a couple words on why with such low costs, large manufacturing capacity, and (presumably) high quality, there's no push to the US happening? What are the barriers? I agree, would like to see comparison to other developed nations, only China and Germany were really mentioned. The take away here is that solar hot water heaters in India are growing rapidly, 41% per year since 2001. I think it will take time for US consumers to feel comfortable enough to install these things on their roofs. Installing it and getting it to sync with existing hot water lines is not hard for a plumber with experience installing these systems, but probably appears daunting enough to would-be consumers to keep them from purchasing these things in bulk. As the industry scales up and service and maintenance on SHW heaters becomes widespread, it'll be a much easier sell. In short, the industry just needs some critical mass. Low-priced Chinese imports will probably help push the market transformation.